BACKGROUND AND PURPOSE: The endovascular approach, with the use of Guglielmi detachable coils (GDC), has been increasingly used to treat ruptured and unruptured cerebral aneurysms in recent years. Our objective was to assess the mid- to long-term radiologic outcome of cerebral aneurysms treated with GDC embolization. METHODS: One hundred and sixty-two patients with a total of 173 aneurysms embolized with GDCs underwent angiographic follow-up 1 to 54 months after the procedure and were reviewed retrospectively. Each angiogram was reviewed by 2 neuroradiologists and 1 neurosurgeon, each of whom made a comparison between the initial and follow-up angiograms. Morphologic outcomes were scored as follows: unchanged, progressive thrombosis, and reopening or regrowth. RESULTS: Of the 173 aneurysms with GDC embolization, 142 had total or nearly total occlusion, 23 subtotal occlusion, and 8 partial occlusion on the initial angiograms. The incidence of reopening was 17.1% (13/76) in less than 3 months and 6.2% (6/97) between 3 and 6 months after the procedure. Four aneurysms (2.3%) were found to be recurrent in the second follow-up angiography within 1 year after the procedure. The 1-year cumulative recurrent rate was 13.3%. Among 56 aneurysms with a third follow-up angiography in the period of 12 to 54 months after the procedure, 4 (7.1%) displayed a slight enlargement; the long-term cumulative recurrent rate was 20.4%. CONCLUSION: The direct and primary causes for aneurysmal recurrence are incomplete and loose packing. The first angiographic follow-up is recommended to be performed at 3 months or earlier for incompletely occluded aneurysms and at 6 months for totally or nearly totally occluded aneurysms. In case of total or nearly total occlusion that remains stable at follow-up, the interval for monitoring should be prolonged appropriately. Retreatment with balloon- or stent-assisted coil embolization is recommended for reopened aneurysms. Traditionally, surgical clipping of the aneurysmal neck has been a valuable, effective method for treating cerebral aneurysms. Since the introduction of Guglielmi detachable coils (GDCs) in 1991,1 endovascular embolization of cerebral aneurysms has been increasingly common because several studies have justified the immediate safety and efficacy of this technique.2–8 Furthermore, the randomized International Subarachnoid Aneurysm Trial (ISAT), comparing endovascular and surgical management of ruptured aneurysms, showed significantly improved outcomes in patients treated with coils in the first year after therapy.9 Nonetheless, the mid- to long-term efficacy of GDC treatment is still unclear and remains under continued investigation, especially in terms of angiographic results.2,4,10,11 Recurrence does occur in some coil-embolized aneurysms, although the rate has varied among different reports. Regrowth of aneurysms with incomplete occlusion and enlargement of residual aneurysm cavity, with or without rebleeding, continues to be scrutinized to accurately determine the recurrent rate.2,4,12 The time and mechanism of recurrence are of vital importance in terms of both appropriate follow-up time and proper preventive measures. The purpose of this study was to evaluate the mid- to long-term efficacy through angiographic follow-up of 162 cases with 173 aneurysms treated with GDCs. From April 1998 to March 2004, 162 patients with 173 aneurysms were treated with GDCs and subsequently underwent angiographic follow-up at Shanghai 6th People’s Hospital. This sample consisted of 63 men and 99 women ranging in age from 17 to 83 years (mean, 49.5). Of these 162 patients, acute subarachnoid hemorrhage was present in 140, unilateral oculomotor paralysis was present in 10, and other symptoms or incidentally found aneurysms were present in 12. Of the 140 patients with acute subarachnoid hemorrhage, the Hunt and Hess Grade was scored as I in 51, II in 60, III in 19, and IV in 10 patients before embolization. Within the entire sample of aneurysms with follow-up angiography, aneurysmal locations involved the internal carotid artery (ICA) C1 segment of Fischer classification (n = 6), ophthalmic segment (n = 8), cavernous segment (n = 6), the posterior communicating artery (n = 58), the anterior communicating artery (n = 54), the anterior cerebral artery (n = 6), the bifurcation of M1–2 segments (n = 13), and the M1 segment (n = 3) of the middle cerebral artery, the posterior cerebral artery (n = 3), the tip of the basilar artery (n = 7), the superior cerebellar artery (n = 2), the posterior inferior cerebellar artery (n = 2), the stem of basilar artery (n = 2), and the vertebral artery (n = 3). The size of the aneurysmal neck was determined on the angiographic projection that best displayed the neck region in relation to the parent artery. Three physicians (2 neuroradiologists and 1 neurosurgeon) measured the aneurysm neck and sac and categorized each aneurysm. The largest diameter of aneurysm was equal to or less than 10 mm in 147 aneurysms and more than 10 mm in the remaining 26. Aneurysms had a narrow neck (ie, neck width ≤4 mm or aneurysm sac/neck ratio ≥2) in 111, and a wide neck (ie, neck width >4 mm or aneurysm sac/neck ratio <2) in 51 aneurysms. The necks of the remaining 11 aneurysms were not demonstrated clearly enough for evaluation. All patients were placed under general anesthesia and subjected to systemic heparinization before a microcatheter (Tracker Excel from Boston Scientific [Natick, Mass] or Prowler from Cordis Corp [Miami Lakes, Fla]) with properly reshaped tip was guided by a platinum-tip microguidewire (Transcend; Boston Scientific) into the aneurysm sac. GDCs of the appropriate size and memory shape (standard, soft, or matrix GDC18 or GDC10; Boston Scientific) were selected according to the size of aneurysm and packed in the aneurysmal sac with the use of the “cocooning” occlusion technique (ie, the embolization is from aneurysm wall to its center) and the “encroaching” occlusion technique (the shadow of aneurysm becomes defective with GDC packing under road-mapping) until the aneurysmal sac was occluded as densely as possible or until another GDC could no longer get in. Remodeling and stent-assisted GDC packing techniques have been used in wide-necked aneurysms since 2002. In patients in whom the aneurysmal sac was totally and densely occluded on initial or immediate angiography after the procedure, systemic heparinization was continued for 24 hours with 4000 U every 6 hours. Use of heparin was prohibited in aneurysms with subtotal or partial occlusion. Immediately after the procedure, digital subtraction angiography (DSA) was performed to assess the degree of aneurysmal occlusion, which was classified as follows: (1) total or nearly total occlusion (95%–100%) when the sac and neck were densely packed with little or no contrast material visible, (2) subtotal occlusion (80%–95%) when persistent opacification of the sac or the residual aneurysm cavity was seen, or (3) partial occlusion (<80%) when occlusion scope was less than 80%, also known as loose packing. The degree of aneurysmal occlusion was again scored by 2 neuroradiologists and 1 neurosurgeon. Each doctor independently evaluated and graded each angiogram. In case of disagreement, a mean value was drawn from the 3 evaluations and was used to make a final decision about the occlusion category to which an aneurysm belonged. The primary follow-up angiography was performed within 3 months after the procedure in 76 aneurysms and between 3 and 6 months in the other 97. Mean time to first angiographic follow-up was 3.9 months after procedure. Follow-up angiography was performed twice in all patients and 3 times in 56. Patients received the second follow-up angiography within 12 months after the procedure. The third angiography was performed between 12 and 24 months in 34 patients, between 24 and 36 months in 16, and at greater than 36 months in 6; the remainder were still in progress at the time of this writing. Furthermore, all patients who had not been followed up angiographically were contacted by telephone. We found that 9 patients had died of unrelated diseases; the rest were alive with no recurrent aneurysmal hemorrhage. The morphologic outcomes were graded as follows: unchanged (stable status of occlusion compared with initial angiogram), progressive thrombosis (reduction or elimination of residual filling of contrast medium compared with initial angiograms), and reopening or regrowth (enlargement of residual neck or compaction of coils compared with initial angiogram). In 12 aneurysms with reopening or regrowth, endovascular retreatment with GDCs was performed. During our study period, 1 patient with a loosely packed aneurysm on the anterior communicating artery died on 50th day after the procedure because of aneurysmal rerupture and was excluded from our follow-up program. Statistical analysis was performed with the use of SAS version 6.12 (SAS Institute, Cary, NC). The χ2 test was used to compare preprocedure and postprocedure data. A P value <.05 was considered statistically significant and a P value < .01 highly significant. All human studies were reviewed by the appropriate ethics committee of our hospital and Shanghai as a whole and have been performed in accordance with the ethical standards laid down in an appropriate version of the 1964 Declaration of Helsinki. All patients in our studies have given their informed consent before their inclusion into the studies. Angiography immediately after GDC treatment procedure showed total or nearly total occlusion in 142 aneurysms, subtotal occlusion in 23, and partial occlusion in 8. The rate of total or nearly total occlusion was obviously and highly significantly (P = .001) elevated in aneurysms with a narrow neck (102/111, 91.9%) compared with those with a wide neck and unmeasurable neck (40/62, 64.5%) (Table 1). The first follow-up angiography, compared with initial angiography, showed no change in 142 aneurysms (82.0%), progressive thrombosis in 12 (7.1%), and reopening or regrowth in 19 (11.2%) (Table 2). 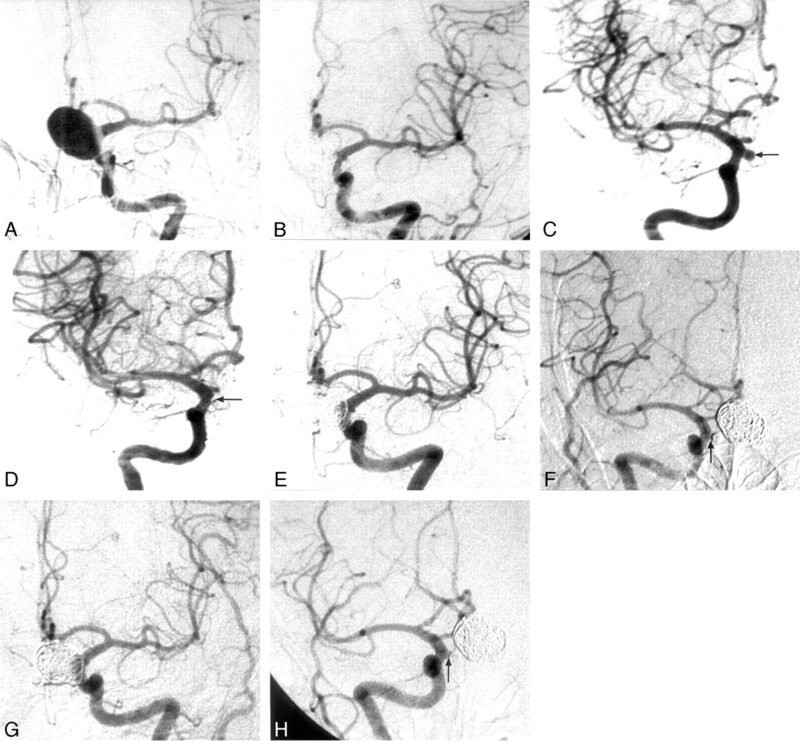 Of the 12 aneurysms with progressive thrombosis, 8 initially displaying near-total occlusion later exhibited spontaneous progression of thrombosis to total occlusion at the follow-up angiography, and 4 initially displaying subtotal or partial occlusion showed opacification reduction of the residual cavity or total occlusion on follow-up angiography. Of the 19 aneurysms with reopening or regrowth, 14 had initial subtotal or partial occlusion, and 5 had initial total or nearly total occlusion with severe spasm of parent artery at the first embolization (Fig 1). Among the 142 unchanged aneurysms, 128 were aneurysms with initial total or nearly total occlusion, and 14 had initial subtotal or partial occlusion. A 45-year-old woman presented with subarachnoid hemorrhage 6 days before this analysis. A, Digital subtraction angiography (DSA) showed an aneurysm of anterior communicating artery (←) with spasm of the A1 segment (arrowhead). B, Postembolization with Guglielmi detachable coils (GDCs), the aneurysm displayed subtotal occlusion (←). C, Follow-up DSA 3 months later showed relief of the spasm of A1 segment and reopening of the embolized aneurysm (←). D, After re-embolization with GDCs, the aneurysm was totally occluded (←). The relationship between follow-up angiographic time and outcome is shown in Table 3. In 19 aneurysms with reopening or regrowth at first follow-up angiography, 13 reopened or regrew at 3 months and 6 did so between 3 and 6 months after the procedure (Fig 2). Of these 19 aneurysms, 8 were re-embolized with GDCs alone, and 4 underwent stent-assisted GDC embolization. All 12 aneurysms obtained total occlusion after retreatment. The remaining 7 reopened aneurysms underwent continuous angiographic follow-up up to 54 months after procedure; 4 showed slight enlargement and the other 3 remained unchanged compared with the last follow-up angiogram. These patients remain under observation. All 12 aneurysms with progressive thrombosis were thrombosed within 6 months after procedure. A 49-year-old woman presented with subarachnoid hemorrhage. 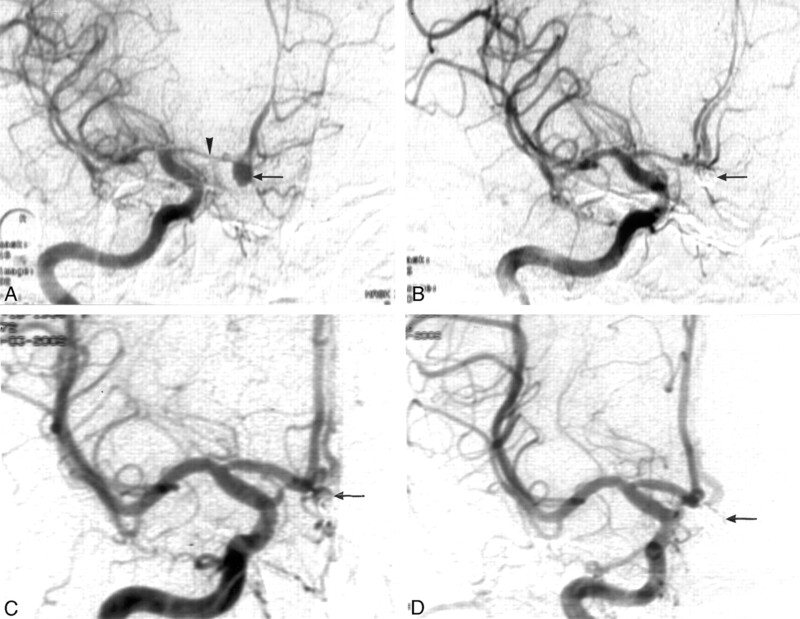 A, Angiography of the left internal carotid artery (ICA) showed a large aneurysm on the C2 segment of the left ICA. B, After Guglielmi detachable coil (GDC) embolization with stent-assisted technique, the aneurysm was nearly totally occluded. C, Angiography of right ICA demonstrated a small aneurysm (arrow) on the right posterior communication artery. D, The small aneurysm was totally packed with GDCs (arrow) 3 months after the large aneurysm had been embolized. E and F, At the 6-month follow-up of the large aneurysm (E) and 3-month follow-up of the small aneurysm (F), the large one was still totally occluded, whereas the neck of the small one had reopened slightly (arrow). G and H, At 14 months, the large aneurysm (G) remained totally occluded to the same degree; at 11 months, the neck of the small aneurysm (H) remained reopened (arrow) as in previous angiography. The small aneurysm continues to be closely monitored. A second follow-up angiography, within 12 months after the procedure, demonstrated 4 patients with reopening of the aneurysm 2.3%, (Table 3), a much lower rate of recurrence than in the period of the first follow-up (17.1% at 3 months, and 6.2% at 6 months), and there was no progressive thrombosis. Fifty-six aneurysms were analyzed with a third angiography more than 12 months after the procedure; the results of this procedure also showed no progressive thrombosis. Four aneurysms that had reopened by the second angiography were found to be slightly enlarged at the third follow-up between 12 and 54 months. The long-term recurrent rate at this time was 7.1% (4/56). The 1-year cumulative recurrence rate was 13.3% (23/173) and long-term was 20.4%. The reopened aneurysms discovered during the second and third visits remained under close monitoring because there was no indication for retreatment. All patients without angiographic follow-up 1 year after the procedure were contacted by telephone; other than the 9 patients who died of unrelated diseases, all were living well without recurrent aneurysmal rupture. Since 1991, GDC embolization of intracranial aneurysms has evolved from an experimental procedure to a well-accepted, widely performed method for protecting aneurysms from rupture or rerupture. Data from many studies have justified endovascular therapy with GDCs, showing it to be a reliable technique with a good anatomic and clinical result for the treatment of both ruptured and intact cerebral aneurysms.5–9,13–15 However, studies have also shown that reopening or regrowth of aneurysms treated with GDCs may occur at different times after the procedure,2,4,7,11,12 thus requiring periodic follow-up angiography to evaluate the efficacy of GDC embolization.2,4,12,16,17 In our first follow-up angiographic study of 173 cerebral aneurysms embolized with GDCs, the incidence of reopening up to 3 months was 17.1% (13/76) and 6.2% (6/97) between 3 and 6 months. Four aneurysms were found to have recurred at the second follow-up angiography (2.3%) with a 1-year cumulative recurrence rate of 13.3%. Fifty-six aneurysms were further followed up with third angiography between 12 and 54 months; 4 (7.1%) of those that had reopened by the second follow-up showed slight enlargement. The long-term cumulative recurrent rate was 20.4%. The incidence of recurrence in the first 3 months after embolization was the highest because partial packing of the aneurysm and spasm of the parent artery necessitated follow-up angiography at 3 months or earlier, whereas those patients with totally or nearly totally occluded aneurysms were not examined until 6 months. Furthermore, the aneurysms with partial packing and parent arterial spasm were more likely to open than those with total or nearly total packing. Although the second follow-up recurrent rate was quite low (2.3%), the 1-year cumulative incidence of recurrence was quite high (13.3%). The long-term rate of cumulative recurrence was 20.4%, which is much lower than in another report18 demonstrating a recurrent rate as high as 33.6%. Reopening occurred more frequently in aneurysms initially demonstrating subtotal or partial occlusion (45.2%) than in aneurysms with initial total or nearly total occlusion (3.5%). Several factors may contribute to aneurysmal regrowth. Enlargement of the residual cavity (neck/sac) is very likely to be responsible for reopening in most aneurysms treated with GDCs. In addition, in partially occluded aneurysms with a residual cavity, the coils are compressed against the distal wall of the aneurysm by the bloodstream, potentially resulting in reopening of aneurysms. Yet another factor is spasm of the parent artery. When this occurs, precise evaluation of the aneurysmal occlusion is sometimes difficult, and the degree of occlusion is often overestimated. Once spasm of the parent artery is relieved,19 the coil-occluded aneurysm may reopen. In this study, 5 aneurysms with parent artery spasm, which were initially scored as nearly total occlusion, showed reopening after relief of the parent artery spasm within 3 months after the procedure (Fig 1). As in surgical clipping of aneurysm neck, the goal of cerebral aneurysmal embolization with GDCs is to exclude the aneurysm from normal circulation. Therefore, aneurysms should be occluded and packed with GDCs as densely as possible to prevent blood from entering the residual cavity and reopening the aneurysms. 16,20,21 It is generally agreed22,23 that a good anatomic and clinical outcome is more likely in aneurysms with narrow necks than in those with wide necks. In our study, the total or nearly total occlusion rate in narrow-necked aneurysms (91.9%) was significantly higher than in wide-necked aneurysms (or in those for which neck size was unavailable) (64.5%; P = .001). The use of advanced techniques,12,23–28 such as balloon- or stent-assisted techniques and the aneurysmal neck-bridge device, show promise toward achieving complete obliteration in large, wide-necked lesions previously associated with suboptimal occlusion. Unfortunately, when this study began, these techniques were not available at our institute, thus resulting in residual neck responsible for reopening in the case of wide-necked aneurysmal embolization. Even if the sac of wide-necked aneurysms can be densely packed by coils, bridging the neck with coil mesh is difficult because of the risk of coil deposits into the parent artery, increasing the risk of parent vessel thrombosis.23 For this reason, wide-necked aneurysms often had residual neck remaining after the procedure. Because this residual neck was usually large enough to act as a small aneurysm, strong blood flow would push against the wall of the residual neck, resulting in progressive thinning and bulging of the neck, finally causing reopening. In this patient, re-embolization with GDCs or surgical clipping should be considered, based on the size and shape of the reopened aneurysms. Of the 19 reopened aneurysms discovered during the first follow-up, 12 were then re-embolized with GDCs immediately after the follow-up angiography and totally occluded. The other 7 patients with reopened aneurysms, along with those found to have done so at the second and third angiographic follow-up, remained under further observation because there was no indication for surgery or re-embolization. Uneven coiling of GDCs in the aneurysm, can sometimes lead to a space between the coils in some large aneurysms, appearing as a “smiley face” on angiograms.29 These aneurysms were categorized as nearly total occlusion in this study. Most of them appeared completely occluded on follow-up angiograms, suggesting progressive thrombosis. In addition, of the 12 aneurysms with progressive thrombosis, the residual cavity of 4 with initial subtotal or partial occlusion appeared smaller to some extent. Because of the coagulation of the GDC itself and hemodynamic changes within the aneurysms after GDC packing, this kind of aneurysm may gradually progress to total occlusion and the patient may recover thoroughly.11,27 Even so, periodic follow-up angiography should continue to monitor the progress of thrombosis. Apart from the above-mentioned single patient who had rebleeding of a partially occluded aneurysm, no other recurrent hemorrhage occurred after coil packing. Endovascular treatment is certainly effective in preventing recurrent aneurysmal bleeding and represents an alternative to surgery in the treatment of ruptured intracranial aneurysms.23,30 The mechanism of preventing recurrent hemorrhage by coil occlusion occurs through direct coil packing plus thrombosis induced by coils and blood stagnation, causing mechanical exclusion of the intraaneurysmal flow. However, direct packing of coils plays a more important role than thrombosis. Coil embolization may more readily induce flow stagnation and promote thrombus formation in tightly packed aneurysms than in partially occluded ones, because blood flow renders partial-occluded aneurysms “unstable” for thrombosis.23 For aneurysms that are not tightly packed, GDCs are exposed to the “water-hammer effect,” which is responsible for aneurysmal regrowth. Among the 12 aneurysms with progressive thrombosis, 8 were initially nearly totally occluded and only 4 were initially graded subtotal or partially occluded. The percentage of progressive thrombosis among initially subtotal or partially occluded aneurysms was only 12.9% (4/31), which we thought was quite unsatisfactory. During the second and the third angiographic follow-up visits, we found no progressive thrombosis, indicating that if no progressive thrombosis had occurred within 6 months, no such progressive thrombosis would occur later. Therefore, when embolizing aneurysms with coils, achieving total or nearly total occlusion is the key to preventing recurrent hemorrhage and regrowth of the aneurysm. Based on analysis of 162 patients with a total of 173 cerebral aneurysms treated with GDCs and subsequent angiographic follow-up, a few points may be summarized as follows: (1) An aneurysm embolized with subtotal or partial occlusion is more likely to experience reopening or regrowth of the residual neck/sac than those with total or nearly total occlusion. Nevertheless, progressive thrombosis may lead to total occlusion in some of these aneurysms with partial occlusion. (2) Loose packing with GDCs in ruptured aneurysms seems to lead to an increased risk of recurrent subarachnoid hemorrhage compared with total or nearly total occlusion. (3) It is recommended that follow-up angiography be performed at 6 months for initially totally or nearly totally occluded aneurysms and at 3 months or earlier for initially subtotal or partially occluded aneurysms. If total or near total occlusion of aneurysms remains stable, the follow-up interval may be appropriately prolonged to 1 or 2 years. (4) Total occlusion should be attained at re-embolization with GDCs for reopening aneurysms, usually necessitating stent- or balloon-assisted techniques. Periodic angiographic follow-up is stressed, especially for reopening aneurysms with or without re-embolization.